Following the passage of the Dubs Amendment, the Home Office is consulting with local authorities to determine how many unaccompanied children the UK will be able to accept. Since each council’s pledge will be determined by its fostering capacity our local Refugee Welcome Team has been working to promote fostering in Redbridge. 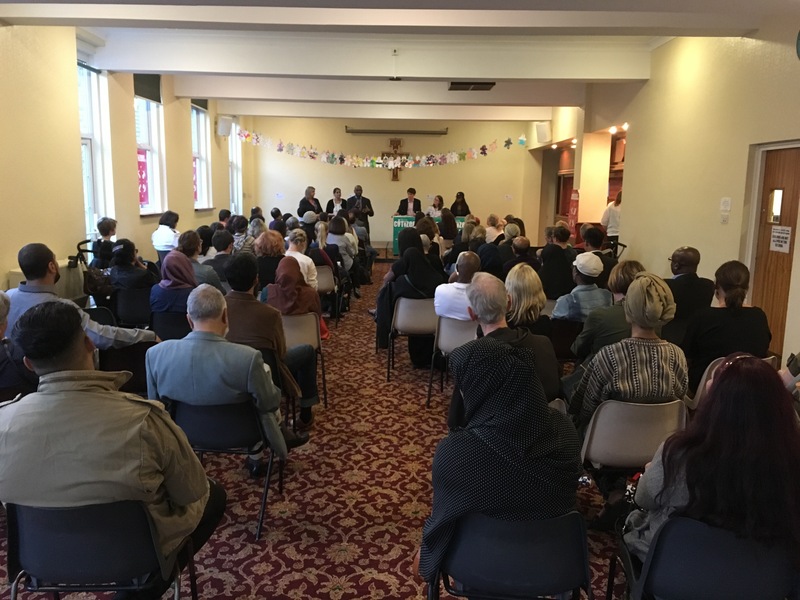 We’ve held an evening to promote fostering to those within our faith communities and to ask the Leader of the Council, Jas Athwal, to pledge to accept five Syrian refugee children. The evening featured presentations from CORAM, Home for Good and Redbridge Council about fostering, as well as testimony from Ernest, who came to the UK as an unaccompanied Albanian refugee, and Farduous, who came here as a Syrian refugee. Following the action, we took time to evaluate. This was an opportunity to celebrate people who had done well, congratulate individuals who had developed their skills and recognise leaders who had brought others to participate in public life. It was also an invaluable chance to learn specific lessons about community organising. How did you feel? What had gone well? What could we have done better? What had changed as a result of the evening? My instinctive response to the final question surprised me. It wasn’t the answer I or anyone else was expecting. Because the answer was me. I had changed. Before the fostering event, I and another member of the team went to meet representatives from the council for a pre-negotiation. I came away thinking that we were asking for the impossible. And so before our event I was a nervous wreck – what was I going to do if the Leader of the Council tried to deflect the question or, even worse, refused outright. I wondered, should we ask for something smaller – maybe ask for less children, maybe not even ask him to commit to act at all. But with the encouragement of others on the team, I found the courage to live with the tension and ask anyway. Justice seeking demanded that I broke free from my concern about looking foolish. It required that I was prepared to fail if the Leader didn’t give us what we wanted. I needed to ignore my natural inclination to play it safe and disturb the present to better the future. Of course, this wasn’t all that had changed. Together we had secured a commitment from the Leader of the Council to accept unaccompanied refugee children under the Dubs amendment, although we were disappointed he would not commit to a specific number in contrast to the Leader of the Council in Hammersmith & Fulham, Stephen Cowan, who committed to his borough resettling at least 10 unaccompanied children. Furthermore, we had recruited sixteen potential foster carers. But nonetheless, the change in me is important because it makes me a little bit more who God would have me be. God’s intention is that our justice seeking, our acts of compassion and our rhythms of discipleship are integrated and interconnected; each a vital and connected part of our spiritual formation. Justice seeking inevitably arises from a frustration with acts of compassion that serve the suffering but don’t address the causes of the misery, However, justice seeking should also shape our acts of compassion so we serve in ways that empower and bestow dignity rather than foster dependence. Similarly, while justice seeking is an important expression of our discipleship, it is also a place where we are spiritually formed as God challenges us to change, highlighting the places where our character isn’t consistent with the person of Jesus and giving opportunity for the fruit of the Spirit to grow within us. However, Adele Calhoun reminds us ‘experiences don’t necessarily bring wisdom, nor do they automatically transform us. We need to listen and reflect on our experiences in the presence of the Holy Spirit to learn from them’ (Spiritual Disciplines Handbook 2005: 57). It’s important that we take time to pay attention to how our justice seeking is shaping who we are, allowing it to transform us into the image of Christ. What do you personally find most challenging about justice seeking? Ask God to show you how this might be connected to aspects of your personality where He is leading you to change to become more like Jesus. Look back over your diary for the last month – how much time have you invested in justice seeking, in acts of compassion and in rhythms of discipleship? Is there a particular area you’re not investing in enough? Since January, when a small group of children were reunited with their families at St Pancras Station, another 178 children have been identified, living in terrible conditions in Calais, who have a right to be reunited with their families here in the UK. Disappointingly, the government has transferred less than 50. Worse still there are 14 waiting for up to 10 weeks, whose travel has been fully approved. It’s not good enough. Join us in calling on the new Immigration Minister, Robert Goodwill to reunite these children with their families by the 25th of August. There’s no reason these children shouldn’t be here in time to start school. Let’s challenge the Minister to find a way and show that we won’t take no for an answer. In addition to this, The Welcome Summit on Saturday 10th September is a gathering for the groups behind the Refugees Welcome movement from right across the country. It’s a moment, one year on from the tragic death of Aylan Kurdi, to come together and celebrate what we’ve achieved, take stock of the British response to date, and to plan, train and act together to build a more welcoming Britain. We will also use the time to build accountable relationships with key actors, from government ministers to UN agencies, around key issues including the protection of refugee children, development of community sponsorship, and building of strong communities. You can read more about the details of the day here, and register your attendance here. “It’s not fair” she wailed, lips pouting and chin quivering, “I want to play houses”. With four toddlers already squeezed into the playhouse and two more trying to crawl in through the door, my daughter was not happy with the state of things. The problem is there just aren’t enough houses for everyone. And that’s not just in the make believe world of pretend play. One of the biggest challenges facing our borough is the lack of genuinely affordable housing. As we’ve listened to the stories of our toddler families, it’s become clear that it’s a problem that particularly affects families in the borough. Many of the families connected with our Baby Bank are living in temporary accommodation, being moved from one B&B to another, or in cramped hostels, sharing cooking and play spaces with countless other families. Almost all the parents at our Messy Families parenting group named housing as one of the biggest stresses of their family life. For many the only hope of finding more suitable housing is to move outside the borough, away from their jobs and support networks. So for some time we’ve been trying to find a way to involve our toddlers and their families in our campaign for more affordable housing in the borough. But this hasn’t been easy. Our assemblies with local councillors have usually taken place in the evenings and for many parents the prospect of an over-tired toddler the next day has just been too daunting! So in the lead up to our housing assembly we realised that we needed to get creative to make the children’s needs heard. And getting creative is just what we did! The goal of the assembly was to ask the Leader of the Council to commit to working with Redbridge Citizens to build 250 genuinely affordable homes as part of a Community Land Trust. So we decided to show him what that would look like by asking the children to paint 250 houses to display around the room. Our toddlers love to paint and it made sense to use their skills to give the Councillor a vision of the change we could make together. We also invited parents to join our “pound4power” action, buying a share of the Community Land Trust for £1 as a sign of the real commitment of real people for the proposal. It wasn’t a big ask so parents were happy to sign up, with many buying shares for their children as well. Like the houses, “pound4power” is a reminder to the council that we have power to effect change in our community – people power. So what have we learned about how our toddler group can change the world? Listen to what matters to families at the group – ask what puts pressure on their family life and what would make it better. Focus on what you can do, not what you can’t do. Make the action small enough for little people to get involved, but big enough to get the message across! Of course, these are just our first steps in justice seeking at toddler group. But as every parent knows, a child’s first steps are just the beginning of a whole new adventure! Do you have any other experiences of getting children involved in justice-seeking? Please share them in the comments below!